Small mixer with stereo effects loops? I’m looking for a mixer — again. 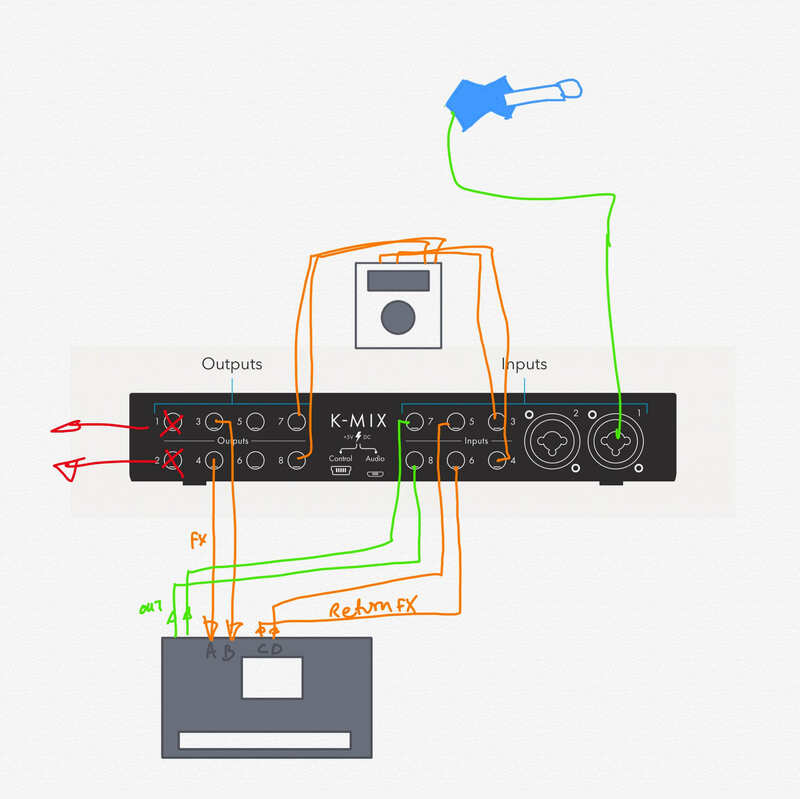 I want something that can connect to the iPad, accept guitar and other inputs, and — this is the important part — have stereo effects loops. Since I got an Octatrack, my little SoundCraft Notepad isn’t up to the task. I want to be able to send stereo signals to the Octa, and also use stereo guitar effects pedal with it. It also has to be small. I have no interest in a giant mixer on my desk. So far I’ve found the K-Mix to cover everything, but that’s over €600. Is there anything cheaper? The A&H stuff is huge, too. The Mackie u.420 has Stereo PRE auxiliary. 4 stereo inputs. Use the fourth for the effects return. I use 3 in my setup. Used for around 80-100 last time I shopped for one. Sorry, by effects loop, what do you mean? Mixers have aux send effects, and then a return for them, but also usually have an insert effect on the output. I have never in my life seen a small format mixer with stereo aux sends. They all send mono and return stereo. You can use two aux sends to send stereo, but that is pretty awkward, having to always set the two aux knobs to be exactly the same. For sending stereo to your octatrack, the other way to do it is with a bus- medium mixers have that as the little buttons down by the fader, where you can send the channel to the L/R out, or the 1/2 group, or the 3/4 group, or any combination. The small mixers electronic musicians use usually don’t have a bus/subgroup, though. One exception I can think of is Mackie, they do an interesting, faux subgroup thing. The mute button has the added feature of sending the muted channel to a separate set of outputs, called “Alt 3/4”. You must be willing to lose the mute button, and use the volume faders to mute the channels. If you want to hear the thing sent to alt 3/4 out of the main output, they have a thing with sources for the headphones, you can hear alt 3/4 out of the headphones/control room out. Then there is a final switch to send the sources for the control room/phones to the main outs as well. This is how I have a Mackie onyx 1220i routed to be able to send stuff to a hardware looper, or not. The 1220i is interesting for electronic musicians, as well, because despite small size, it has a large number of stereo channels with line inputs. Jeez, that’s even uglier than the Mackie U.420! Plus the usual main speaker outputs, and USB for iPad hookup. The idea is that I can send stereo audio from the iPad or the Octatrack, send it through the H9, and then back again. I also want to be able to record iPad synths etc direct to the OT, in stereo. Form what I can tell, the Keith McMillen K-Mix will do this. I’d prefer real buttons and sliders, but I checked one out in store a while back and found the touch controls to be very responsive. The K-Mix has 8 ins, and 8 outs. Any of the outputs can be configured as AUX sends. I could put the H9 directly in the Octatrack’s FX loop, but I still wouldn’t have a way to send stereo from the iPad to the Octatrack.